Details at the end of this post on how to enter to win a copy of Dreadnought. We also have a link to order it from Amazon, and from an indie bookstore where a portion goes to help support KRL. Dreadnought is about 15 year old Danny Tozer. Danny is secretly painting her toenails behind the mall one day when two meta-humans get in a fight right by her. When the superhero Dreadnought dies, she is the only one there so she receives his powers. But Danny gets so much more than that–it transforms her body into the one that she has always wanted–now everyone knows that she is a girl. Her parents react very badly to this, especially her abusive father, but she is determined that nothing and no one is going to take this away from her. To make things even more complicated, the super-villain who killed Dreadnought is still out there. 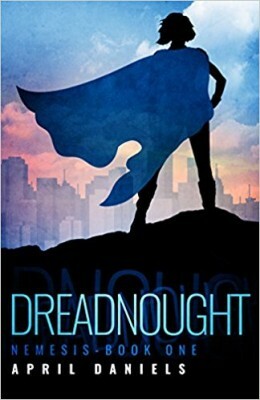 Danny loves who she has become, but she is not certain that she wants the responsibility of being a superhero, especially as powerful of one as Dreadnought. The reception that she gets from the Legion of Superheroes doesn’t help her apprehension. They are the group of superheroes who protect the city. The Legion brings her in when they learn what has happened, but some of them are horrible to her and prejudiced against someone who is transgender. She is also hurt by her best friend’s response to the change. The bright side to this for her is a new friend that she makes named Calamity-who is trying to save people outside of the Legion. This is a very complicated world that April has created with different levels of meta-humans–some just deciding to use their powers to do normal jobs. There is a lot of action and adventure in the story, and surprise twists, but the best part of the story is Danny–her struggles and the journey that she goes through to fully become who she is. While at first the fact that this book is in present tense really threw me, I am glad that I stuck with it because it is such a wonderful book that after a bit I totally forgot about the tense! Being cisgender I came into this having no clue what someone who is transgender goes through other than what I have seen on TV and from friends. April takes us right into the mind of Danny and we get to see everything that she is feeling and going through–it was mind blowing, eye opening, and very emotional. While I can never truly walk in the shoes of someone who is transgender, I feel I have a much better grasp on what they go through than I did before. This is an absolutely amazing book! Not only is it a fun and exciting superhero adventure, but it is a wonderful, moving story of facing prejudice and standing strong to be who you are meant to be. It will make you laugh, cry, gasp, and want to punch some of the characters. I love Danny and I wish I could just give her a great big hug–she is inspiring and real despite being a superhero. I can’t wait for the rest of the books in this trilogy. Author’s note: April can write such a genuine transgender character because she is transgender as well. To enter to win a copy of Dreadnought, simply email KRL at krlcontests@gmail[dot]com by replacing the [dot] with a period, and with the subject line “dreadnought,” or comment on this article. A winner will be chosen May 6, 2017. U.S. residents only. If entering via email please include your mailing address, and if via comment please include your email address. I have friends across the whole LGBT spectrum and would love to add this book to my library. A recent post from Nora-Adrienne: April Showers bring May Flowers and New Books. Sounds like a must read. Thanks for the great review.